Let me preface this with: We really want to raise kids equipped for The Good Life. Whatever that may be, for them. We know, though, that being a happy worker is a good thing. So is a worker who has follow through. I know this, I didn’t think I needed the husband to tell me these things, which is why, now that I have written the following post, I believe the conversation started so badly. Yesterday I was part of an annoying conversation. I’m not sure why it bugged me so badly, but it did. First of all, there was a too-serious tone to it. Secondly, I immediately became defensive, which was probably unnecessary. So, the husband wanted to talk to me about our kids’ work ethic. I automatically considered the conversation all about me and my work ethic. Big surprise there, huh? It took a while, but now I realize he really did mean it to be about THEIR ability to see a job through. The questions he asked us, as parents, were: how much work should be required of them (we expect them to be active members of our household, to feel needed and wanted and necessary to us, rather than having the feel of entitlement.) So, how much time in a day should be free time, to run, play, explore, experiment, pursue hobbies and relationships with friends etc. We feel this is a hugely important part of their growing up years, also. Infact, I once went to a talk at a homeschool group, the most impressionable point that was made was from a survey of people who, as adults, were very successful. These ‘successful’ people had to be considered successful (even by themselves) in the following areas: financially, in their relationships, consider themselves happy, so in lots of ways other than just material, that was her point in explaining ‘successful’. (Mainly, no drug/alcohol abuse, no self loathing, never been to jail, really important things we DON’T want our kids to experience.) There were quite a few threads they had in common, some that I remember the most are: 1. they felt wanted and needed at home, they had responsibilities at home and were depended on. 2. they had lots of free time to explore the world around them. 3. they had limited time with peers, they weren’t over involved in social activities. 4. they had dinner together as a family every night. Interesting information, I thought. Anyway, back to the point. After the husband and I went around in circles, trying to get to the point, we came to the conclusion that we wanted our kids to have a certain amount of work ethic and have them know they would need to contribute to our household/homestead a certain amount of time each day. If they know this, they would not be surprised and disappointed when the time came to do their jobs. (Just had to stop to pull at tick out of Kitty’s eye. GROSS!) Um, where was I. So, if they know that they will be required to contribute, they will do it HAPPILY and with GREAT effort, right? No whining will be needed. I’ll keep ya’ll posted on that. The other questions is ‘what is work?’ This is the part that bugged me. The husband thinks that work is not cleaning up yesterdays mess, that should have been cleaned as we go. So, this has been left undefined. Due to the fact that he always cleans as he goes, I never do, we are not seeing eye to eye on that point. But, I will keep track of what I have the kids do. Today there was a fair amount of ‘awwww, do I have to?’ Not too much fighting about it, or bickering, which is what I HATE to listen to. Here is what I had them do: Kyler – clean the upstairs bathroom, sink, counter, toilet, floors, clean, scrub and disinfect the camper that Kaleb had cleaned the junk out of yesterday, the fridge, counter, sink, floor, bathroom. Kaleb- unload strainer, downstairs bathroom: sink, toilet, sweep & mop, clean kitchen counters off, move rugs, shoe shelf in laundry room and sweep & mop, sweep deck and stairs off. Maya – feed dog, help fold laundry, feed kitty. She has a ways to go before she gets a bunch of work to do. Not that she’s incapable, but she’s terribly spoiled and I need to fix that. I’ll do that later. Anyway, here is a picture of the boys working on unloading the wood. 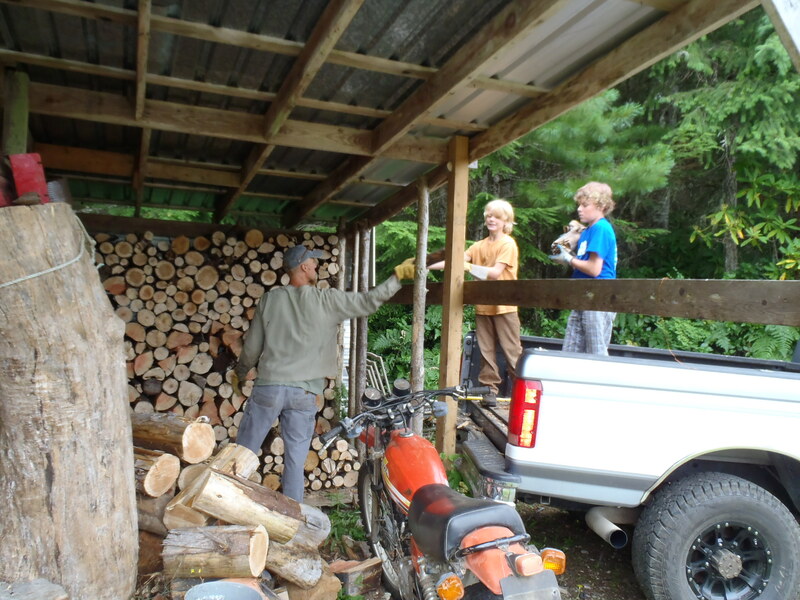 Isaac always says that collectting firewood warms you twice, once when you gather it and again when you burn it! Working for our winter warmth! This entry was posted in Rasing Kids for The Good Life-YIKES! Big Job., Simple Living, The Good Life Homeschooling and tagged good life with kids, homeschooling, self reliance, simple foods, simple living, simplicity parenting, simplicity parenting teens. Bookmark the permalink.